WHAT’S SO GREAT ABOUT CRIME FICTION? 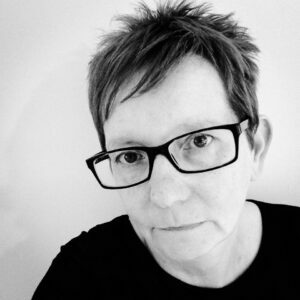 Author Kate Vane guest blogs about the power of crime fiction to question the controlling nature of institutions and explore people’s motivations. 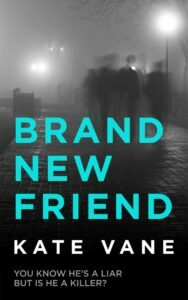 As a crime novelist herself, Kate has been praised for her skilful pen portraits: ‘Characterisation was the thing that really made this book great for me.’ – Ashrae (Amazon top 500 reviewer) on Brand New Friend, Kate’s latest novel. Crime fiction is a broad genre and offers different things to different people. Some like a high-concept premise and the pleasures of solving a puzzle. Others like the adrenaline surge of an action thriller. Cosy mysteries take us into a world where violent death can be tidied away by engaging and humorous characters (there’s even a subgenre where mysteries are solved by cats). The crime fiction that most interests me explores people and their motivations. Why do individuals do what they do, and how does society respond? The crime and its investigation are a vehicle to explore the world where they take place – whether it’s the dynamics of a small community, a political system, or even conflicting forces in a space station. (Chris Brookmyre’s Places in the Darkness manages all three!). Unlike cosy mysteries, where the story ends when order and meaning are restored, many of my favourite crime novels depict a world where justice is provisional or arbitrary. It may be individual police officers who are corrupt, it may be institutions, it may be the state itself. Within such an environment, people must work out their own moral code. In Attica Locke’s novels, her black protagonists in the American south strive for justice using the forces of the law, while acknowledging that the system is rigged against them. Manda Scott’s World War 2 thriller A Treachery of Spies contrasts the purity and heroism of the Resistance fighters with the cynical manoeuvring of their political masters, who are already positioning themselves for a new world order after the war. In James Ellroy’s Perfidia, a Japanese forensics officer with the Los Angeles police is investigating a murder immediately after Pearl Harbour. He needs to know the truth even though his superiors require a Japanese scapegoat. Some crime fiction features characters who are extraordinary gifted. They have talents way beyond those of the reader, who can only look on in wonder as they deploy them. They have to face setbacks but even when they apparently make a mistake, it will prove to be just a part of their ingenious plan. I can see the appeal of characters like these, a Sherlock Holmes or a Count of Monte Cristo who will solve all your problems, even when they appear intractable. One who appears to be able to read everything about your innermost thoughts just through powers of observation, so you don’t even need to bother thinking for yourself. However there is no real emotional journey or sense of growth, for either the character or the reader. And the devices that they use to solve the crimes are, like stage magic, impressive until you see how it’s done. A lot of contemporary crime fiction dispenses with the detective or the authority figure and instead focuses on the ordinary person who is confronted with an extraordinary situation. They have abilities as well as flaws but only in the same way we all do. In this situation the reader is more able to empathise with the character rather than look up to them. They make mistakes, they dig themselves in deeper, there seems to be no way out, and then they see a solution we couldn’t have thought of (so in that sense we hope they’re just a little more clever than us or we’d guess the outcome first!). Another popular trope is the character who is trying to redeem themselves, whether because they have committed a crime, succumbed to addiction or experienced some kind of professional failing. They may be just like us, or they may have both talents and flaws which are extraordinary. Mick Herron’s Slough House series features a group of spies who were recruited for their gifts, but then each failed in some way. They are exiled to an office where they are condemned to complete the most menial of tasks and yet still somehow manage to embroil themselves in drama, combining both emotional truth and exciting escapism. The latest, London Rules, is also a fantastic satire on Brexit Britain. Crime fiction is often about conflicting memories and partial information. Even those novels which rely heavily on forensic evidence or data have twists based on the interpretation of the known facts. In life we are always trying to understand the difference between what people mean and what they say, to form a coherent narrative from incomplete information, and to find the truth that resonates with us. We are living in a time of political upheaval when nothing is accepted as certain, where there are no shared values or symbols, where we are all telling different stories about the same facts. The protagonist, Paolo, is a BBC journalist. He learns that Mark, a friend and fellow political activist during his student days, was actually an undercover police officer. He believes that two deaths – one in the present and one in the past – may be linked to Mark. Paolo’s memories of his past, his friendships and the events that formed him are thrown into doubt. After a career spent being famously impartial, he has to decide where his loyalties lie. Endings, of course, are crucial. Maybe the killer doesn’t get caught and punished, but the reader should at least learn who the killer is. Some people will argue this makes crime fiction contrived and unrealistic, that in life often there are no answers. To me, a novel is an argument, and the author must offer their conclusion. A good ending should both surprise us and make perfect sense, and a great one should leave us with a better understanding of the world than we had before. You can find out more about Kate Vane's writing at her website here, her Twitter page here and her Facebook page here. Great to meet Kate and learn about her crime mysteries, Leslie. I don’t think we will ever tire of crime novels; every writer has a different take and every decade brings new scenarios for the criminal and the author. To discover someone is not who you thought, such as undercover police ( who have been uncovered in recent years! ) makes a devious plot.